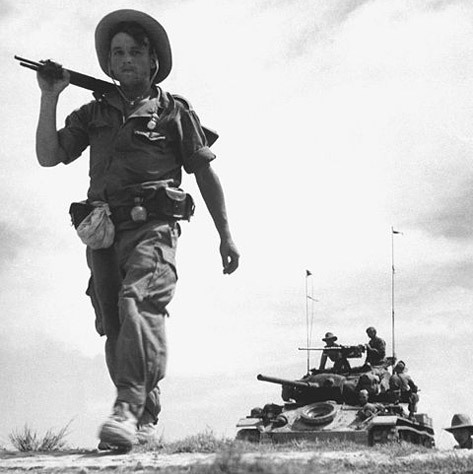 In early 1950, when France had granted the Associated States of Indochina a mostly fictitious independence, the U.S. granted diplomatic recognition to those states and quickly began sending military aid to Indochina, or, to be more specific, to the French in Indochina; all U.S. aid, from beginning to end, went only to the French, who used it as they saw fit. This was made possible by the Mutual Defense Assistance Act passed toward the end of 1949, which permitted the president to spend up to $75 million in military aid in “the general area of China .” Shortly thereafter, the U.S. announced that it was going to increase its military aid and in September, a MAAG for Indochina was set up. The outbreak of the Korean War had led Truman to accelerate the delivery of aid, with the result that large quantities of weapons and equipment began sluicing into French hands: during “a single week [in] January 1951 the French received from the United States 20 M24 tanks, 40 105-mm. howitzers, and 250 conventional bombs, as well as napalm bombs, 105-mm. ammunition, automatic weapons, and small arms.” Aid began to be sent straight from U.S. stocks in Japan . By January 1953, 900 combat vehicles had been delivered to the French, along with “15,000 other vehicles, almost 2,500 artillery pieces, 24,000 automatic weapons, 75,000 small arms, and nearly 9,000 radios. In addition, French air units had received 160 F-6F and F-8F fighter aircraft, 41 B-26 light bombers, and 28 C-47 transports plus 155 aircraft engines and 93,000 bombs.” By the time of the final French defeat, U.S. aid was running at over $1 billion a year (about $5.8 billion in 2004 dollars) and paying some 78% of the French war costs. 1) Pentagon Papers (1971: vol. 1: 11, 77); Spector (1985: 137, 168); Gibbons (1986: ch. 2).